In November, we went to EPFL (école polytechnique fédérale de Lausanne) for our second training week of INFRASTAR project. During this training week, we presented our previous result and progress but we focus on discussing our future plan: what we will do during the following years, how we cooperate with other ESRs. MR Ernst Niederleithinger gave us a course about signal analysing. Mr Marek Salamak gave us one of the most interesting lecture. then we eat fondue together. What 'spirit' should we have for team working and project management. We spent a great time together, I am so happy to meet all the ESRs again. And I learned a lot during the second training week. I can't wait for the next training week. Thanks to Mr Eugen Brühwiler for organising this event. Implementation of CWI on real bridge!!! Why we do scientific research? The final goal is to apply science in our real life!! I would say, correct! We are like this! We need to read a lot of articles, we need to do test in the lab, we need to analyze our data on PC. BUT! As a civil engineer, we are also like this: In September and October 2018, I did my secondment in Neostrain, KRAKOW, in Poland. I was lucky to have a chance to implement CWI method on a real bridge (Gliwice bridge). Embedded ultrasonic sensors were installed inside the bridge girder. Measurement devices were locked in this big box under the bridge. Me and ESR3 Joyraj did the test together. We monitored the bridge girder for 5 days to study the influence of real traffic and temperature. Now we have some interesting result and we are planning to publish papers based on this test. Follow INFRASTAR for more information. Hi everyone, today I will introduce a Mega project which must be very interesting for all ESRs of INFRASTAR project. 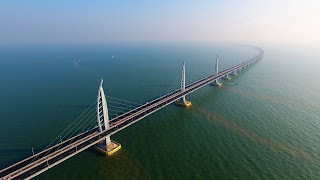 This week, the world's longest bridge 'Hong Kong-Zhuhai-Macao Bridge' is opened officially. This bridge will connect three chinese cities: ZhuHai (in GuangDong province), Macau and Hong Kong. 4 hours drive will be shortened to half an hour. I just came back to BAM from a 3 weeks business trip. Tired, but meaningful. 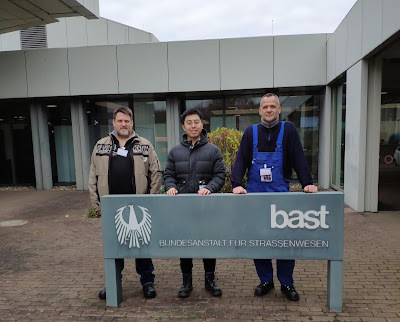 I worked together with my colleagues from BAM, Marco and Heiko. I am so grateful for their professional and precise work. I am very luck and happy to have the chance to installed our embedded sensors and implement our method on a real bridge. Now, let's start the work! (measuring the distance to determine the position of sensors) (Checking rebars by GPR device) Drilling holes on the bridge. (installing sensors......) This is how it looks in the end, beautiful, isn't it? All the cables were protected well in the PVC tubes.